In March 1838, Joseph Smith moved his family and the center of the Church from Kirtland, Ohio, to Far West, Missouri. Only a month later, on April 27, 1838, while engaged in establishing a new gathering place for the Latter-day Saints in Caldwell County, Missouri, he again began writing a history of the Church “from the earliest period of its existance,” this time with the help of his counselor Sidney Rigdon and his secretary George W. Robinson. Only a small segment of the history was written before the project was suspended, no doubt due to the conditions that forced the removal of the Latter-day Saints from the state later that year and resulted in the imprisonment of the Prophet. Not until June 1839, shortly after his arrival in Illinois from his six-month confinement in Missouri, and again only one month after moving his family into a small log house near Commerce (later Nauvoo), Illinois, to begin anew the process of community building, did Joseph Smith turn his attention back to writing the History. Dictating to James Mulholland, Joseph continued the work he had commenced the previous year—a work that some sixty years later would be edited by the Church historian Brigham H. Roberts and published in six volumes as the History of the Church of Jesus Christ of Latter-day Saints, Period I, History of Joseph Smith, the Prophet, by Himself. The beginning pages of this history were in time canonized as scripture in the Pearl of Great Price and contain the best-known account of the First Vision. … I then said to my mother, “I have learned for myself that Presbyterianism is not true.” It seems as though the adversary was aware, at a very early period of my life, that I was destined to prove a disturber and an annoyer of his kingdom; else why should the powers of darkness combine against me? Why the opposition and persecution that arose against me, almost in my infancy? 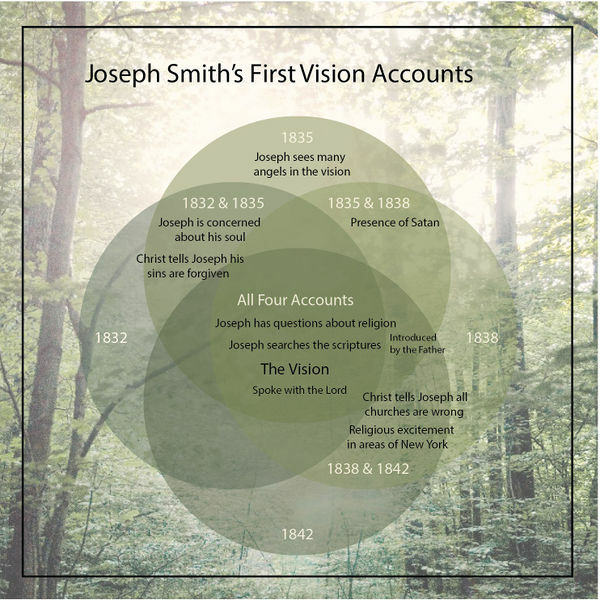 This entry was posted in Church History, First Vision, Joseph Smith and tagged 1838 Account of the First Vision, First Vision, Joseph Smith, Pearl of Great Price. Bookmark the permalink.